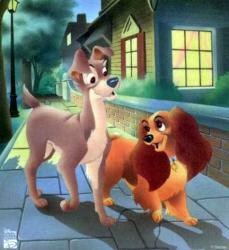 In Lady and the Tramp, Lady, the well-bred and pedigreed cocker spaniel, meets Tramp, a mutt of uncertain origin and even more uncertain manners, and love blossoms in one of the family movies created by Disney in 1955. Jim Dear and Darling are celebrating Christmas, and Darling opens a lovely hatbox to find an adorable cocker spaniel puppy. Darling is delighted, and Lady soon becomes a beloved part of the family. But one day, soon after she's been given her first collar, Lady's world begins to unravel. Darling suddenly doesn't want to go on walks or play, and one day she smacks Lady's bottom when Lady insists on playing with a ball of yarn. Hurt and confused, Lady goes to her friends Jock and Trusty for consolation. Being older, Jock and Trusty realize that Darling is expecting a baby. Lady wants to know what a baby is. Enter Tramp, who is wandering the neighbourhood in his free-wheeling, scrounging way and overhears the conversation. He tells Lady that a baby is a little bundle of trouble, and that her world is about to change for the worse. Jock and Trusty chase him away, but Lady is now more confused than ever. When the baby is born, Lady is included once again in the family. Until Jim Dear and Darling take a brief trip and leave the baby in the care of Aunt Sarah, who brings her two siamese cats with her to Lady's house. When Lady tries to protect the household goods from destruction by the marauding felines, Aunt Sarah takes her to the pet store and gets a muzzle. The humiliated and frightened Lady runs away. Lady is attacked by a pack of larger dogs, and Tramp comes along and saves her. Lady and the Tramp then go on a tour of "his" part of town, culminating in a romantic spaghetti and meatball dinner at Tony's. Lady is having such fun that she loses track of the time, and it's not until the next morning that she realizes how long she has been away. Tramp starts to take her home but diverts her into chasing chickens. 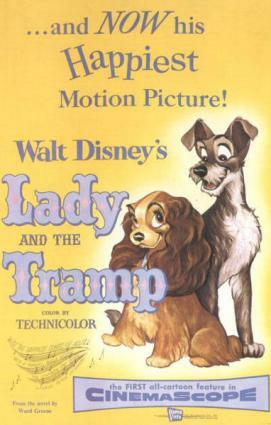 In the melee that follows, Lady and Tramp are separated, and Lady is captured by the dogcatcher. While Tramp searches frantically for Lady, she's rubbing shoulders with some very questionable characters down at the pound. Someone mentions Tramp, and Lady learns more than she wanted to know about the mutt she's fallen in love with. He's a womanizer and a wanderer; Lady decides that he's not worth her time. Aunt Sarah finally comes down and gets Lady, and takes her home ... only to tie her up outside in the dog house. While Lady is miserably bewailing her ruined reputation, Jock and Trusty come to offer her a way out of her unhappy home -- by marrying one of them. When Tramp shows up, Jock and Trusty leave before Lady can make her wishes known. Tramp tries to explain what happened, but Lady makes it quite clear that she wants him to leave for good. Tramp goes, but he's not very far away when he hears Lady barking furiously. He runs back to see what has happened, and she tells him that a rat has gotten into the baby's room. She can't get in the house to protect the baby because she's still tethered to her doghouse. So Tramp goes in and fights the rat, killing it just as Aunt Sarah comes in to investigate the tumult and the crying infant. She calls the pound, and they come to take Tramp away ... saying that he will be put down immediately. Just then, Jim Dear and Darling arrive home, and Lady, who has finally managed to break the rope, shows them the dead rat. Jock, Trusty, and Lady all run to try to save Tramp, and they cause the dogcatcher's van to crash. Jim Dear and Darling are so grateful to Tramp for saving the baby that they adopt him, and Lady and the Tramp are finally united, to live happily with Jim Dear and Darling forever.